Wondering about the list of manufacturers for each year. I assume that info was discovered by going over military records concerning contracts for materials? Seems like if a company was awarded a contract that they would have been obligated to fulfill it. What I'm trying to say, surely lanterns were produced in each of those years? going through the MilSpec Syndicate thread, picked up a couple of missing years, 1959 and 1983. There are still a lot of missing years. Jester -Thanks for posting in this thread. I would like to see the 3927 with the conversion, if you have pics available. I thought there would be a little more interest/participation in a MilSpec. Inventory. Think I have a neighbor who has a '53 Coleman, but will have to confirm. OK updated the list. I am adding this line so that it marks a stopping point. another reason someone mentioned a while back for year gaps came to mind. if a company had won the contract for 1984 it could have been for two years, and all lanterns made under that portion would be stamped 1984 and not necessarily 1985 since they were part of the 1984 contract. I have no way to verify this though. do folks want to keep this running or start a fresh thread? I have a 1945 Coleman Milspec. I am still trying to get it to light. I am aware they can be tempermental, so I will keep trying. I had a car that had a special way to get it to start. Most reliable car I have ever owned. 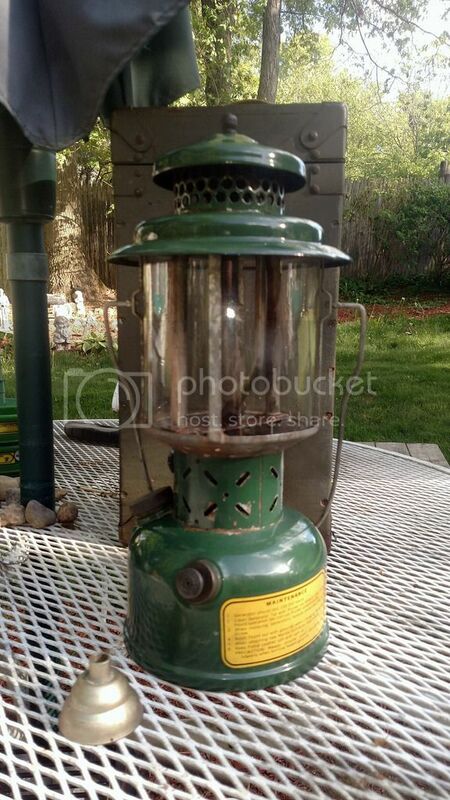 Antique & Vintage Coleman Lantern & Stove Collectors? Sure, go ahead with the FB inquiry if you want, I don't do FB so just report back if you'd like. Thanks! HRidarick- I've got 55 on the list, not sure what Curly has going . I have a '52 Coleman and an '86 SMP although they are already covered here in this thread. You never know when you might need to know how to jump out of a perfectly good airplane! Thanks for posting the link to your photos, that is an interesting model (IMO) and hope to find one someday. Good info on the 2 year contract, Curly. I'd never heard that before, I think that having three consecutive years stamped founts would make it hard to agree with, especially for those years. Posted to facebook, only picked up a 1988 SMP, all the rest that were reported are already on the list. Thanks for your effort. Added the 88 to the list. Still hoping others here will check theirs and post. Here's a post you helped answer some questions on. I'm not sure what date you want to call it, based on the burner or lantern date. Hello John, on this thread, concentrating on founts from actual MilSpec lanterns with the dates on them. 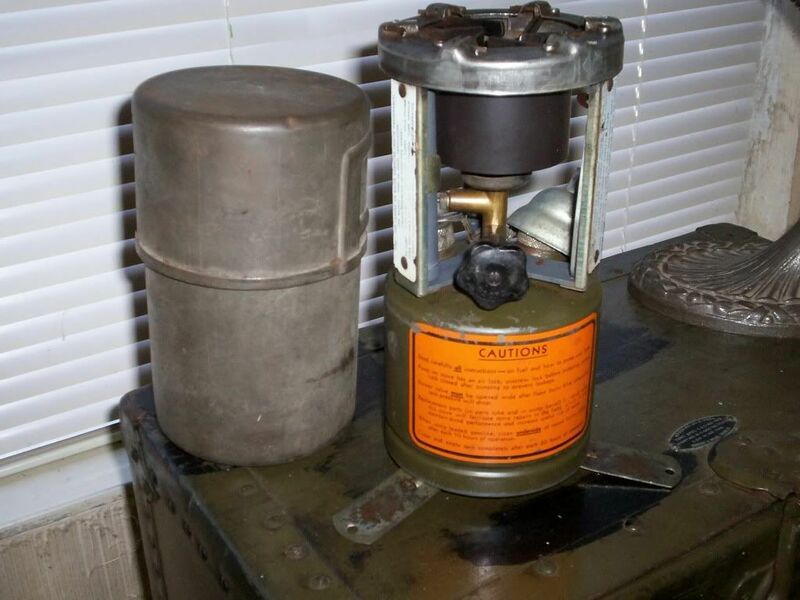 Your lantern from the earlier post was one that was converted using the alladin conversion burner (as you know) but was not "born" a MilSpec. BTW, I really like the one you posted earlier. Ok im on a phone today and will add an 88 at next chance. hey If anyone sees an error PLEASE feel free to mention. I found a second listing of Randall's that I missed in the consolidated list. Thanks Curly, added the 85, slowly filling the gaps. I'm about 99 percent sure my neighbor has a 53, i need check it and get a pic. Anyone else have any of the "missing" years? I wonder if this info will be in the new greenbook? Yes! The milspec info is very detailed and thorough. Milspec lovers should be very happy. Obviously, the non-Coleman years are not covered. Good deal, Thanks for the info. Hope to have a copy in hand in about a month. Are there examples of all the Coleman years? Just got my 1981 MilSpec, an SMP. I lit it up and did a quick (well a long video) of it shutting down. Most people will not watch the whole thing as it is long. Rangler--the milspec section has multiple tables listing the key features for each of the 5 "types" constructed by Coleman (and years made), plus excellent photos of each representative type. It is an impressive study of 252's. A must have source for any collector. Only the Coleman Milspecs had a model number. Coleman called the original 252 and when the quad globe was introduced in 1952 gave it the number 252A. None of the others have a number. So there is no such thing as an SMP 252A for instance. Early production from 1944 and 1945 were made by AGM, Akron, and Coleman with Aladdin making burner sets to convert exising lanterns and possibly to supply burners for the other three. here is a picture of a funnel posted by Ben Cartwright . i believe this funnel is from AGM and not a coleman ? what you say ??? i call em the beehive funnel . Ben Cartwright- don't forget to trim your mantle strings. Just FYI! I thought it was called a "burner bowl funnel"? Second on the 1944 Coleman, it came with that funnel from the PO, it was not attached to the lantern, so no idea whether it is right or not. On the strings, it just looks better, IMO, and said to have potential to break your mantle. ya , i find it a NEAT looking funnel , its an early one . its not a very common one and not a coleman shape . but will work just the same . Any info I can get on funnels or other parts is always appreciated as I really have very little knowledge on these things. On the strings, no offense taken, and hearing they could cause a problem will change my behavior. I used to run mantles that even had holes in them until I learned that they can cause problems with some sort of flame that could reach the globe and cause problems. here is one on a agm stove , just sharing useless trivia . Here is a poor pic to compare next to a burner bowl. did a search on past posts here and found references to a 1954 and a 1975.
here's a link to each. SOoooo that's your EBAY handle! yeah I did, and now that I am trying to fill gaps in the years, I can afford to EBAY buy once a month or two. Looks like I'm a Mil-Spec collector now :-) 1986...same year I went into the USAF, so kind of appropriate. Overall just a couple of rust spots...mostly dusty. Just missing the funnel. Can't wait to fire it up. The mantles in the packages were a separate purchase. Does anyone know anything about them? they are military supply issue mantles. the ones not in a bag are older than the bagged ones, I saw then in the supply chain in the later 80's. Thanks Curly. I just looked through it and it is exactly what I need. I'm no real help to fill in the years. I have a 1952 Coleman, a 1963 King Seeley, and a 1984 SMP. Chad- Thanks for posting. That new conversion is really cool! Curly- I added the years you dug up...Thanks! Wow that is an awesome find! I always though the conversion kit fit on existing valves. never had any idea that it include the valve assembly. So it turns out one might just have needed a fount with the 1/2-27 threads (or 1/2-32 ) for it to convert, whoda thunk it? wonder if it fit all brandds. Trying to post a pic of the neighbors MilSpec that I thought was a '53, turns out I was wrong (again) and it is a 1954. Anyways, here is a pic of the bottom for verification.